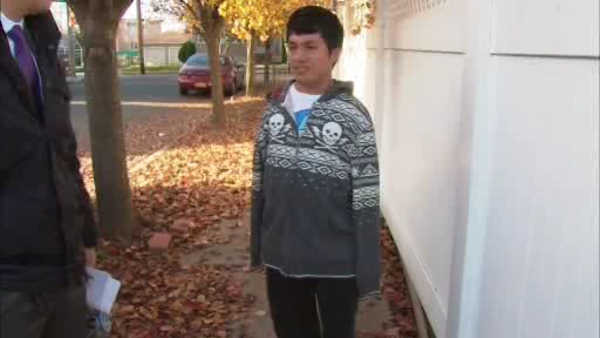 PORT RICHMOND, Staten Island (WABC) -- Police have arrested five people, including two juveniles, in the mugging of a man on Staten Island who has no arms. The victim, 18-year-old Carlos Simon, spoke to Eyewitness News soon after he was robbed outside a Dunkin' Donuts in November. This week, police arrested a fifth suspect in Pennsylvania. Vincent Popalardo was brought back to Staten Island to face robbery and grand larceny charges. Gomez said it was in the Port Richmond section of Staten Island, when a group of four people robbed him. They thought he was a vulnerable victim because he had no arms. Simon says at first, he thought the group were panhandlers. Two men and one woman approached Simon and asked for money, but when he said he did not have any, Simon says the three surrounded him, and things turned hostile. They tried to go through his pockets, and then a fourth individual ran up behind him, and snatched his cell phone, which he had laid down on a ledge next to him. Simon chased the man for a few blocks before giving up - that is when he realized what was going on. Simon says he noticed before the robbery all four suspects together. When he got back to the Dunkin' Donuts, the other three demanded money again, claiming they tried to help him get is phone back. That is when things turned physical. "As I keep saying 'no', they surround me, and they started pushing me around, and tried to go through my pockets and stuff. They tried to drop me on the floor, but thankfully I have a lot of good leg strength," said Simon. Simon managed to fight them off, but even after all that, he is taking the high road. He says he is not angry at them.